Why Work With CorLux Financial? Navigating the waters of financial, investment and tax planning* can seem scary and daunting. There is much to consider, and who to entrust to help you is the first big decision. 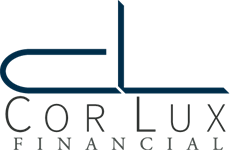 At CorLux Financial, our personal goal for each and every one of our clients is to inspire confidence and bring a sense of peace and wellbeing to any financial undertaking you come to us with. In order to achieve that, we offer holistic guidance and lifelong partnership to continually make your financial goals a reality, no matter how your needs and life evolve over time. We’re different because of the level of commitment and attention we give to our clients, which we don’t view as mere clients at all, but rather members of our own family. With Values Based Financial Planning, we ensure that we understand your goals, values and what’s important to you as an individual so that we may form the most well-rounded, efficient plan of action possible.